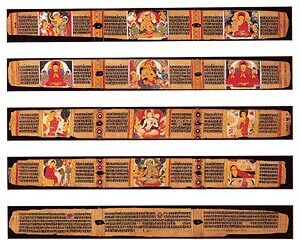 The Buddha Shakyamuni's life story was codified by artists and philosophers into eight standard scenes which both encapsulate the Buddha's biography and provide a model spiritual life for the devotee. Known as the "Eight Great Events," the scenes depict (from left to right, excluding the central deities): the Buddha's miraculous birth from the side of his mother, Maya; his victory over Mara, the god of death and desire; his first sermon; a miracle he performed at Shravasti in which he multiplied himself; his descent from the heaven of thirty-three gods; his taming of the rampaging elephant Nalagiri; the offering of honey by a monkey; and finally, his death. The central images of each leaf represent specific deities (from top to bottom): the goddess Prajnaparamita, the Bodhisattva Manjushri, the Bodhisattva Avalokiteshvara, and the goddess Tara. This manuscript is particularly important because of the inscriptions on leaf E, which record, in Sanskrit and Tibetan, the history of the manuscript from its creation at the famous Nalanda monastery in India through its use in Tibet by the compiler of the first Tibetan canon of Buddhism, Buton, to its dedication for the benefit of a Tibetan nobleman as part of his funeral rites. These inscriptions illustrate how Buddhist manuscripts helped spread both Buddhism and its imagery from India to other parts of Asia.